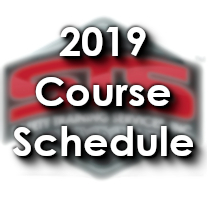 Click Below to See our Safety Training Course Schedule for 2019! Note: To save the document to your computer, right click on the image and select "save link as" or "save target as." Additional information about these training sessions is available on our course description page or call our office toll free at 877-724-2744. We look forward to hearing from you! If you require training that is not on our open enrollment schedule, need a special session for just your group, or if you are interested in training at your facility instead, please contact us. Step One: Register online for Open Enrollment Courses by clicking here. Step Two: Pay for your course. Payment options include: Cash, Check, Money Order, VISA, Mastercard, Discover, American Express. If you would like to pay by credit card, you may choose to complete this Credit Card Authorization Form. If you or your company would rather be invoiced directly on Net 30 day terms, please Download the New Customer / Credit Application Form and send either form by fax to: 219-554-2185 or by email to Melinda Gee at mgee@safetytrainingservices.net or call our office toll free at 877-724-2744. Note: All registrants must register online for a course. Please register early and contact our Training Manager Thomas Moore at (219) 554-2180 for any assistance. Substitutions/Transfers: Substitutions are welcome up to 24 hours in advance of the course start date without charge. Transfers to another course date will be accepted up to 24 hours in advance of course date without charge. Cancellations: Cancellations made 14 days prior to your course date will be fully refunded, no fees. Cancellations made less than 14 days prior to your course date will be refunded minus a $25.00 fee. No Shows: No shows, Contact after course begins - No refund. Insufficient Enrollment: We'd like all of our courses to run for participants involved, but we must make realistic decisions in order to offer quality instruction, materials, and comfortable classrooms. Our goal is to offer attendees the interaction you expect from a quality provider. If we notify you or your company representative that your training course is cancelled, we will be sure to offer you two choices: (A) Transfer to another course without penalty or (B) a full refund of your payment. For those planning to travel, call us anytime toll free at 877-724-2744 for enrollment updates and be sure to book a refundable plane ticket. Maps, driving directions, and additional transportation and lodging options.